This epistle is driven by a couple of facts, a couple of notions and a little nostalgia. Most important some of my favorite people in the world are not for some mysterious reason on the Ray and Lorna Coppinger Endowment Fund list (Copendow) which means you don’t get the annual reports of what the student/faculty recipients are doing and you don’t get my annual report of what I have been doing. This note tries to remedy that. I had a good time all through the 40th anniversary weekend catching up with a number of people I hadn’t seen since my 2006 retirement party. But sadness caught me by surprise. What do I do now wait until the 50th to tell a story? To correct my problem I decided that Copendow report should not only report on what is happening but I think it should recall all those good trips of the past. It is always the 40th anniversary of at least one good trip and next year will be the 40th of another. Try it see if it works. 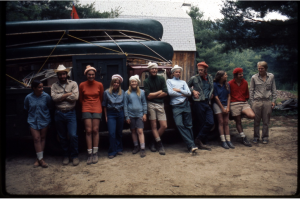 In August 1971 (40 years ago) there were 11 of us Hampshire people that went on a one month, 300-mile wilderness canoe trip. But first, in July, we had to build our own canoes. 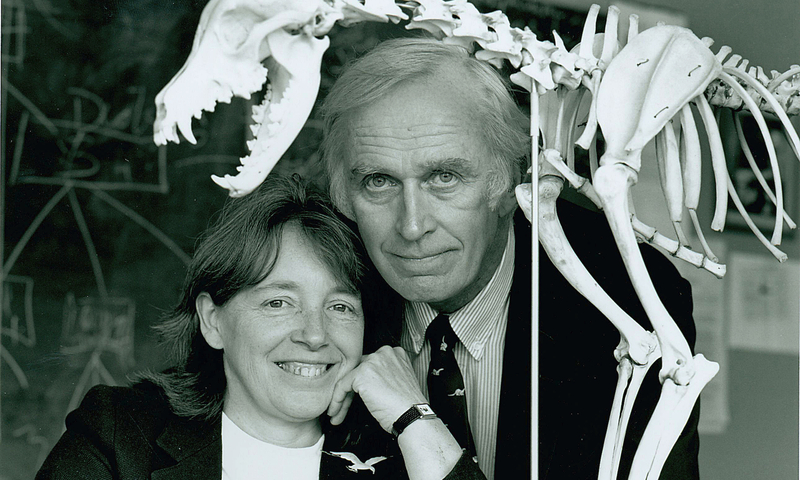 Lorna and I had purchased an old canoe from the Harvard boat club in 1958. It was a nice canoe and we took good care of it painting it every year. Well a gallon of paint weighs 8 pounds and in ten years we had added 80 pounds to the canoe. Trying to get Lorna to portage around waterfalls got increasingly difficult. I took the canvas off in 1965 and wrote the company asking for a new canvas, new gun’ls and instructions on how to do it. I got a letter back from the Old Town Canoe Company that said “I’m sorry to inform you that the B.N.Morris Canoe Company of Veazie Maine burned down in 1919. If we could be any help let us know. The canoe went into the barn and didn’t come out until the summer of 1971 when Mike Sands F’70, Emily “Mouse” Groves (now Yazwinski)(F’70, Hallie Thorne (now Rintle)(F70) and Paul Rothenberg (now missing)(F’70) used the canoe to make a mold, and made five fiberglass canoes. 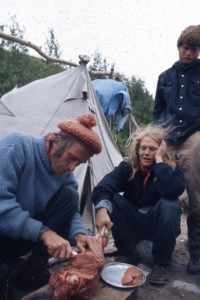 Those were the years when the outdoors program was making their own kayaks so the construction of our canoes was guided by experts. Then we had a couple of practice sessions at Ruggles Pond, and a sendoff celebration at great canoeists Chuck and Polly Longsworth’s house where Chuck gave us the last little lessons on how to pick up a canoe and portage it around the neighborhood in South Amherst. First of August we took off for the Hearst Ontario to the Kabinakagami (gami means river). On the way we had to stop one night in North Bay at the hospital because Karyn Coppinger (F’84) had an ear infection. I explained to some old sawbones that I needed to get on with it but had this problem with my 11 year old. He gave her something and said she might sleep for a while which turned out to be three days. When she awoke the earache was gone and we were a ways down (up) (down) (it runs north) the Kenogami. We actually drove to the river, unloaded all our gear and drove several miles back to the main road and left the two cars, and my dog truck. Then the Canadian Forest Service guy took us back to the river. The Kabinakagami went into the Kenogami which went into the Albany River which flowed to James Bay at the Indian town of Fort Albany. We packed all our gear including 500 pounds of dehydrated food (Yukon chowder was nobody’s favorite). We picked berries, caught and ate Canadian Geese that were molting, Mike caught northern pike, and we bought a moose leg for $2 Canadian from an Indian family who had just shot it. Ellen Kiley ate three servings of moose so she could brag to her brothers, when she got home. Most days were easy and sometimes we made a raft of the five canoes and sailed and slept. There were days we had races – see who could get to the Ghost River first. Karyn and I won by a mile. The old man and the kid as our canoe was labeled were always last mostly because I wanted everybody else downstream of me not wanting to have to paddle back up stream at night if someone didn’t show in the evening. The 15 mile race came with several big meanders in the river and Karyn and I stayed way out in the current rather than cutting for the corners. I think after the first river bend we were miles ahead of the rest, who were battling the back flow along the curved shore line. The old man and the Kid had the fire lit and the hot chocolate ready before anybody else got to the Ghost River Island. Ghost River was called such because it was haunted – The Iroquois had snuck up on the Cree and massacred them. They say for years you’d be washing your socks on the river’s edge and a skull would float by. We camped there for days, exploring. We found the remains of the old town and the cemetery with its wooden grave stones rotting away. All the way we identified trees, seined the tributaries and talked ecology. We got to Fort Albany on James Bay and spent several days celebrating. The local priest invited us to the movie at the church where, with four hundred Indians, we watched “Massacre at Black Rock.” The cowboys slaughtered the Indians. Our 400 Indians cheered for the cowboys. The eleven of us were very quiet and didn’t cheer for anybody. We departed down James Bay with the five canoes loaded on Antoine the Indian’s barge and toward the town of Mooseonee . We hit a head wind on the way down and had to wait overnight on a tidal flat until the wind backed around. 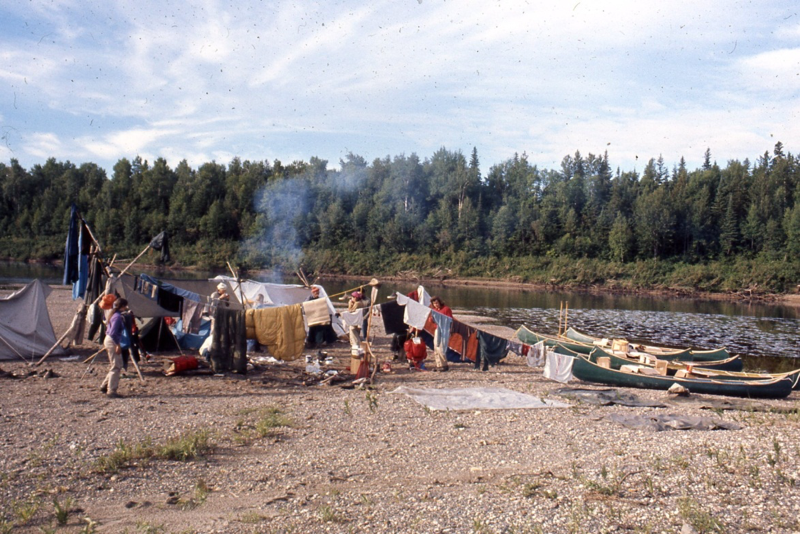 As it were we made it to the mouth of the Moose River with one gallon of gas left. That day Paul Rothenberg, Emily then Groves and I think Mike headed out that afternoon on the Polar Bear Express for Cochrane. They thumbed rides from there back the couple hundred miles to the vehicles. The rest of us slept in a box car in the freight yard. 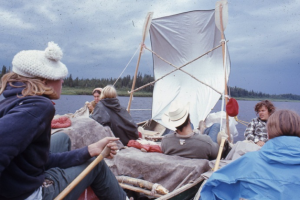 The next day we took the PBE (it took all day) to Cochrane with all our gear, including the canoes. That was a fateful train ride for me. We met another canoe expedition. 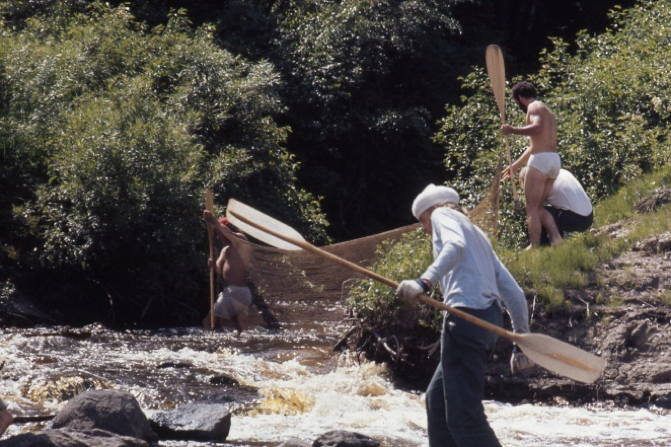 They had “shot” the Moose River and bragged about their record speed – three days. We bragged that it had taken some twenty odd days. One of their numbers was my now dear friend Dave Schimel (and future Nobel Prize winner) who thought we had a better attitude about wilderness and enrolled at Hampshire. We met Paul, Mike and Emily at Cochrane loaded the canoes and started home. We stopped at a barber shop and us guys got a shave and a haircut. We went home past Niagara Falls. The story isn’t quite over. The canoe we made the mold from has been hanging in our barn for the past forty years. It has been a great nesting habitat for swallows. Lorna says I should “move it along.” I thought it might be 100 years old and worth something, and went on the web. Sure enough B.N.Morris canoes are collectors’ items. One lady told me where the brass tag was that identified that it was made in 1905. That should be it. If you like the story you could send $100 to the Copendow. “If you don’t die it’s an adventure” – Rays words to us as we planned our river trip. Take the risks, live life to the fullest, challenge yourself, have fun…. these seemed to be the lessons he taught us then and by the example of his life. It’s hard to think that life is over …better to think he has moved on to a new adventure. Next PostNext Fond remembrances of Ray, his life, and his work are welcomed here.